'If all he said the other day was targeted against me, it is unacceptable and I take strong exception to it,' former Railway minister Pawan Kumar Bansal tells Anita Katyal in an exclusive interview. Known to be self-effacing and low-key, four-time Member of Parliament from Chandigarh and former Railway minister Pawan Kumar Bansal hit the headlines last year when his nephew Vijay Singla was arrested by the Central Bureau of Investigation while accepting a bribe of Rs 90 lakh (Rs 9 million) on behalf of a Railway Board member for a posting of his choice. Bansal stepped down after the Opposition upped the ante against him. His carefully nurtured reputation as a man of integrity was shattered overnight. He has spent the last ten months explaining his position to his electorate and convincing them that he is not guilty as no evidence had surfaced against him. As the Lok Sabha election drew closer, there were murmurs in the Congress that he might be denied a ticket because of this controversial case. Party colleagues, notably Information and Broadcasting Minister Manish Tewari, were said to be eyeing Bansal's Chandigarh seat. Tewari's recent statement -- that tainted ministers should not be given tickets -- was seen as an indirect attack on Bansal. The humble and soft-spoken Bansal was eventually named for the Chandigarh seat as he has always enjoyed Prime Minister Manmohan Singh and Congress President Sonia Gandhi's backing. Bansal got his first break in politics in 1984 when he was elected to the Rajya Sabha at the age of 36. He won his first Lok Sabha election in 1991 and has steadily risen up the political ladder, holding several important portfolios. Bansal was named as the Congress candidate for the Chandigarh seat on Thursday. In an interview to Anita Katyal, a relieved Bansal says he is confident about winning his Lok Sabha seat again even as he steadfastly denies his role in the bribery case involving his nephew. There were some doubts about your candidature when your name did not figure in the Congress party's first list of Lok Sabha candidates. Your colleague Manish Tewari was said to be eyeing your seat. He made some statements about tainted leaders not being allowed to contest elections which led to speculation that he was indirectly targeting you. I don't think there was any delay in announcing my name. My name may not have figured in the first list, but it was among the first... so many seats are yet to be declared. It is everybody's right to lay claim to any seat, but finally it is for the party high command to take a view. People can have exaggerated notions about themselves. I know Manish has been trying for the Chandigarh seat since 1991, but I have never considered him to be a rival. I can understand his desire and ambition to represent the Chandigarh seat. If all he said the other day was targeted against me, it is unacceptable and I take strong exception to it. I am sure he knows the facts of the case. All I can say is that nobody agrees with his evaluation of a person being treated as tainted on the basis of mere allegations. If that was the case, it would negate the fundamentals of criminal jurisprudence and show utter disregard for the judicial system. 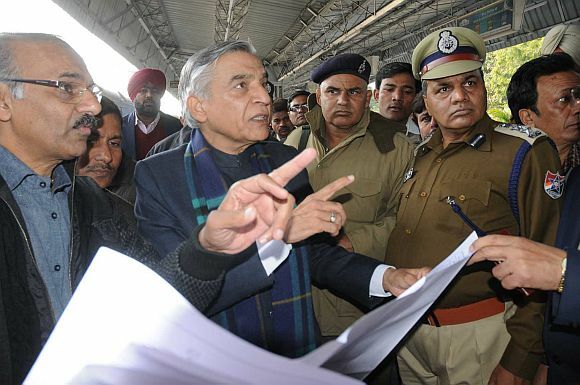 Image: Former Railway minister Pawan Kumar Bansal. Your name was eventually cleared for the Chandigarh seat. Does this mean the party has given you a clean chit and that the bribery case is now a closed chapter? The party leadership knew I was not guilty of any wrongdoing. That's the reason I was made chairman of the party's screening committee in Rajasthan, Gujarat, Daman and Diu and Dadra and Nagar Haveli. If there was any doubt about me, the party leadership would not have given me this responsibility. There is not a shred of evidence against me. I always knew there was nothing against me, but it was confirmed when I got a copy of the chargesheet and I was not named in it. I was not accused of anything. This was further fortified with the dismissal of a petition seeking re-investigation of my case by a CBI court. I am not before a court in any case. I have only been cited as a prosecution witness. But it is a fact that your nephew was involved in the bribery case. Since my nephew was involved in the case, everybody rushed to pass judgement of guilt on presumption without waiting for the legal process to be completed. The case is now before the court. I don't know anything about his involvement as I have not been talking to him since this matter surfaced. In fact, I am a victim and target of a sustained mendacious campaign of slander and calumny. Earlier, I would say this was because of ignorance or malice. But increasingly I believe it is malice... even the use of the word taint is malicious. I am being pronounced guilty because my nephew was involved... it is a wrong presumption. You tend to become vulnerable when you are in such a position. There is no legal case against you, but this issue will be used by your opponents in the Lok Sabha election. This cannot become an election issue. People in Chandigarh know me, know my work. I have been there all my life. They have had umpteen occasions to observe me. There is sympathy towards me as they believe I am a victim of a conspiracy. I have explained all the details of the case to them over the past ten months since I resigned as rail minister. In fact, all the taped conversations between the accused only goes to prove that they were not in touch with me regarding appointments to the Railway Board. 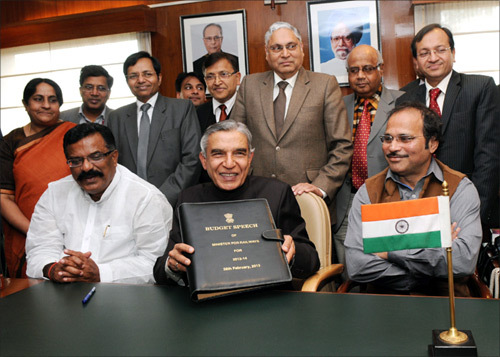 Image: Then railway minister Pawan Kumar Bansal before presenting the Railway Budget. Nevertheless, the BJP is bound to raise the matter in the campaign. The Bharatiya Janata Party has nothing against me, but I also know that their state leaders will raise this issue during the campaign. Anybody who is aware of the facts cannot raise this issue. But I have confidence in the people and they have confidence in me. And this will not be the first time that the BJP will be gunning for me. They have run a vicious campaign against me in every election, but the discerning people of Chandigarh have always rejected this kind of campaign. The more they raise this issue, the more they will suffer. But it is a fact that your nephew has been an active member of your election campaign team. My family is my asset. They all help in my election. So how do you plan to counter your opponents? I have already explained the facts of the case to the people. The issue in Chandigarh is development and the work I've done is there for all to see. For instance, the budget for Chandigarh has risen five times in the last ten years. I have never promised the moon to the people. I don't deceive them with false promises and people appreciate that. Besides the BJP, you now have another political rival in the field, (actress) Gul Panag from the Aam Aadmi Party. I welcome her entry into politics. She is not only an actor, but also a social activist. You cannot just enter the electoral fray at the last minute... you have to first work with the people, you have to be accepted by them for the work you do in your constituency and not what you have done elsewhere. You have to grasp the problems of the place and acquire knowledge to address the same. Despite the setback you suffered last year, how confident are you about winning this election. I am extremely confident because of the work I have done. People in Chandigarh know I work earnest and sincerely. 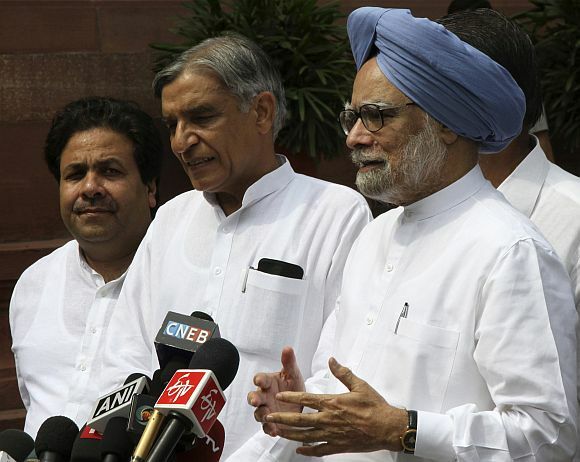 Image: Pawan Bansal, centre, with Prime Minister Manmohan Singh, right, and Rajeev Shukla.